Thursday 20th June 2013 was a significant occasion in the school calendar, when an event took place in St Paul’s High School to mark the success that had been achieved in the last 3 years through the Shared Education Programme. 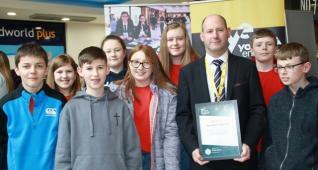 Funding provided by Atlantic Philanthropies gave an opportunity for pupils to explore identity and appreciate the richness of diversity and cultures represented by the pupils in South Armagh. It was a privilege to see Ulster Scots dancers performing their intricate footwork between crossed swords. Pupils of the school, who are also members of Whitewater Pipe Band, drummed and piped in perfect harmony and rhythm. Members of the joint rugby team performed a “haka” on stage, much to the delight of the large, mixed audience of parents and governors from various schools in the area. 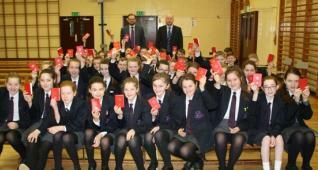 Pupils from St. Paul’s also celebrated their culture with performances of traditional Irish music and dancing. The memory of such fine performances, particularly of Ulster Scots culture, appearing on stage in St Paul’s High School and being so much appreciated, is a source of satisfaction. As Mr Mooney (Principal of St Paul’s) stated in his closing speech, this collaboration and venture into Shared Education does not mean a loss of identity for either tradition, rather an opportunity to showcase what are cherished parts of our respective traditions and all carried out in an atmosphere of respect. A big “Thank you” therefore goes firstly to the pupils who performed so admirably on the night; secondly to the parents, without whom the event would not have been possible; thirdly to the teachers who worked so tirelessly in the background and those who attended on the night; fourthly to the governors, who have supported me on this amazing venture into unknown territory; finally to the sponsors. Arguably, none of this great progress would have been possible without the funding available and the advice provided. 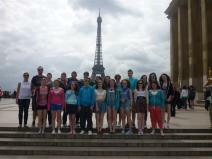 31 pupils from Years 8-11 have returned home safe and well following a 4 day stay in Paris. The group departed from Newtownhamilton on Sunday 23 June and experienced a busy schedule during their time in the French capital. Monday started with a panoramic city tour of Paris which included many of the world’s famous sights of Champs Elysees, Rue de Rivoli, Louvre Museum, Notre Dame Cathedral and Montmartre. 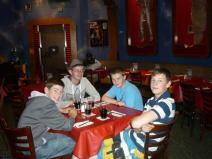 The second day saw pupils enjoy a visit to Euro Disney before a visit to the Eiffel Tower on the Wednesday. The trip concluded with an opportunity to purchase gifts for family and friends during a spot of retail therapy in the city centre. 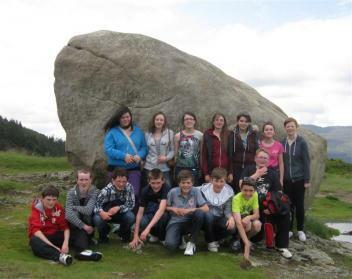 A fantastic experience of fun, adventure and culture for both pupils and staff. 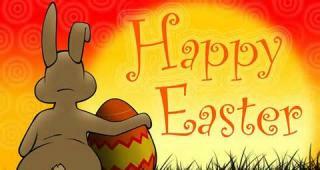 Special thanks to teachers Mrs A Laverty, Mrs J Ferris, Miss L Graham and Mr D Sloan for providing supervision. The last day of term will mark the end of a 17 year career at Newtownhamilton High School for Senior Teacher Mrs Barbara Beattie. Mrs Beattie taught Maths during her time in Newtownhamilton and also had many positions of responsibility during the years. She was also a committed co-ordinator of Scripture Union. The staff and pupils at Newtownhamilton High are grateful to Mrs Beattie for her dedication over the years and offer best wishes for her retirement. Work continues on the new canteen with builders currently creating a corridor to link the new building to the main school. 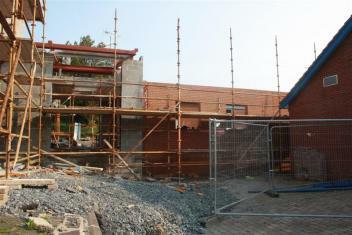 The work, which is being carried out by Dixons Contractors (Dunloy), is moving at a steady pace with the completion date scheduled for the end of August. 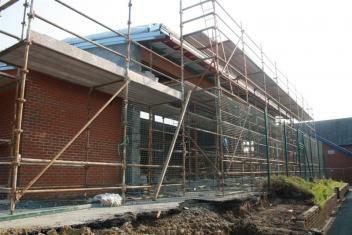 It is hoped that this new facility will be up and running for the return of pupils in September. Despite missing a few classmates due to the Paris trip, pupils from 9X enjoyed a day out of school with Form Teacher Miss Baird on Monday 24 June. The trip started with an energetic climb to the big stone at Kilbroney Park followed by a well deserved ice cream in nearby Warrenpoint. Finally, some retail therapy in the Quays (Newry) on the way home ended off a perfect day. Thanks to Miss Baird for organising the trip. 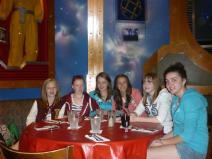 The Scripture Union ended another successful year with a trip to Funtasia in Drogheda on Monday 17 June. SU meets every Thursday at break time and regularly features guest speakers who share their message with the pupils. The trip to Funtasia provided an opportunity to share fellowship while having some fun on the many indoor activities available. The final SU meeting of the year saw the pupils make a presentation to Mrs B Beattie, who is retiring at the end of June. Mrs Beattie has been a faithful servant to SU over the years and her presence will be missed. In addition to Mrs Beattie, thanks must also go to Mrs J Ferris and Miss K Johnston for their contributions to SU during the year. 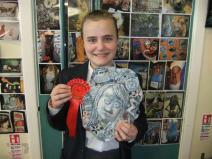 Pamela Hamilton in Year 8 enjoyed success at Armagh show after she entered her clay wall mask and swept up the first prize in her category. The clay wall piece is a portrait of herself and her interests and has been decorated with oxides, underglazes and transparent glaze. Parents are advised to place orders for school uniform early in the summer holidays. 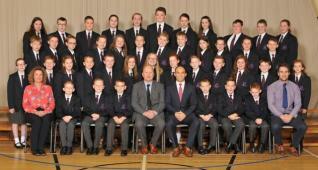 Parents of the new Year 8 intake should note that a new clip-on school tie will be compulsory from 01/09/13. 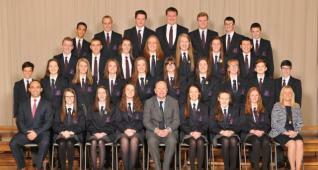 Any other Year 9-12 pupils purchasing a new school tie are encouraged to buy this new version. For more information on school uniform, please contact local supplier Mrs Gracie Donaldson at Newtownhamilton Post Office on 02830 878979. It is with regret that our School Association Treasure Hunt and Barbecue scheduled for Wednesday 19 June 2013 has been cancelled due to another event being held in the local area that evening that is likely to impact on numbers attending. 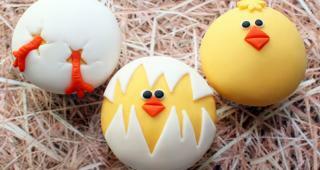 Year 11 Business Studies students enjoyed a visit to the dairy farm of Roy Harpur & Son, Divernagh on Friday 31 May 2013. Pupils got to see how the business had grown from a hand milking operation in 1952 milking 10 cows, to a 4 point parlour in 1966 accommodating 30 cows, to a 16 point parlour in 1977 milking 160 cows to its present 34 point swing over parlour, currently milking 400 cows. Technology is used in many areas of the farm. For example, storing information about all the livestock, accounting, registering and moving of livestock, computerised machine feeding of calves, allocating feed to cows during milking, alerting the workers of antibiotic cows when they enter the parlour and using GPS during sowing of fertiliser and spraying. 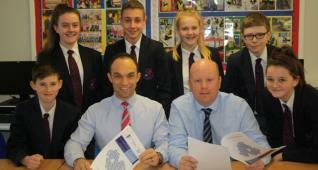 Pupils were also made aware of risk assessment, health and safety and quality assurance. Pupils had the opportunity to observe a system of zero grazing, which has been in operation on the farm since 1999. This is a system whereby fresh grass is brought into the livestock daily during the grazing season. This has been of great benefit to the cattle this year due to the adverse weather conditions and it allows the farm to carry 20% more livestock on the same acreage due to the high percentage of grass utilisation. Seeing this business in action allowed pupils to see their business studies theory in practice and will be of great benefit as they continue their studies next year. We would like to thank Roy, Robert and David for taking the time to give us such an informative guided tour. Click on the link below to watch a video of the farm. 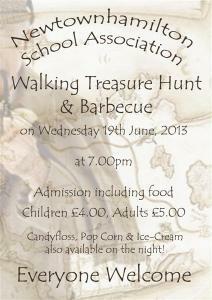 Our vibrant School Association has organised a Walking Treasure Hunt and Barbecue to be held on Wednesday 19 June at 7.00pm. The treasure hunt will cover an area from the school grounds down to the Commons and the main town square with appropriate supervision to be arranged. Participants can compete as individuals or in teams. Back at the school, a barbecue will be held for the returning hungry treasure hunters. Participants will be provided with a burger, sausage and juice/tea/coffee. 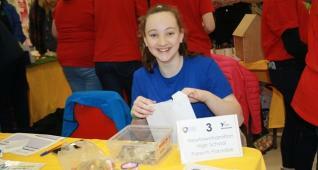 The combined cost of the treasure hunt with food is keenly priced at £4 per pupil and £5 per adult. A stall selling pop corn, candy floss and ice cream will be available for anyone that is still hungry! Everyone welcome - it should be fun. 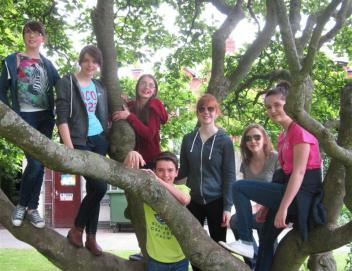 Newtownhamilton High - at the heart of the community!